Markets are higher this morning as Greece will get another shot of aid for its banks. Bonds and MBS are down. The EU agreed in principle to a 7 billion euro bridge loan to Greece which will keep the lights on while Tsipras negotiates a bigger bailout loan. The deal still has to be approved by a number of countries, and the vote was actually more contentious that people were thinking it would be. The Iran deal faces some opposition in Congress, but it will probably end up passing. I don’t see a major economic effect, aside from some pressure on North Sea Brent oil prices, which really only affects the East Coast. The rest of the country is based on West Texas Intermediate, and the two types of oil are not fungible. While the Republicans generally view the deal as a capitulation, the Democrats are split between the pro-Israel bloc and the far left bloc. Initial Jobless Claims fell to 281k last week from 296k the week before. The Bloomberg Consumer Comfort Index slipped to 43.2 from 45.5 as well. Janet Yellen continues her trek to the Hill today, and will appear before the Senate this afternoon. Yesterday’s testimony in front of the House was pretty uneventful. She didn’t deviate from the what she said after the June meeting – they want to get off the zero bound, but will be data-dependent. 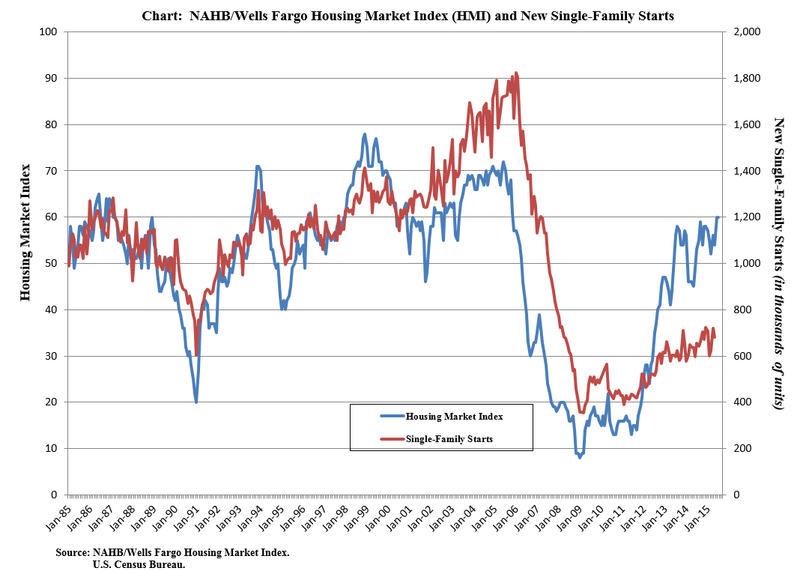 The NAHB Housing Market Index came in at 60, the strongest reading since early 2007. While builder sentiment has remained buoyant, it hasn’t really translated into housing starts. Typically, sentiment leads housing starts, and if the chart below is any indication, starts are lagging but need to catch up. I suspect they will as prices remain high and inventory remains tight. Note: we will get housing starts tomorrow morning. The Street is forecasting a 1.1 million run rate. Interesting take on the nuke deal. The result was that a deal originally conceived as trading sanctions relief for Iran’s nuclear program evolved, over time, into a deal trading sanctions relief for time-limited restrictions on Iran’s ambitious nuclear plans, enforced through a vigorous monitoring, verification and consequences regime. Perhaps that new, lesser deal — one that kicks Iran’s potential to be a nuclear weapons threshold state into the future — is still in America’s interest, but one should begin any analysis by recalling how far we have come from the original intent of sanctions and U.S. diplomacy. Another indication that the negotiations were not driven by the NNPT: Iran got relief from sanctions that were in place for reasons wholly apart from its nuclear program. Many (most?) of the sanctions against Iran were related to its terrorist activity, human rights violations (its violation of non-existent things?!? ), and its proliferation of non-nuclear weapons. Funny how Iran was able to include demands unrelated to nuclear proliferation, but the US was not. Rather than speculating about the cost of selling “fetal parts” as written in the Washington Times the transcript indicates that Deborah Nucatela was speculating on the range of reimbursement that patients can receive after stating they wish to donate any tissue after a procedure. “… the range of reimbursement that patients can receive after stating they wish to donate any tissue after a procedure”? Come again? Apparently in the Alice in Wonderland world of the left, “donate” means “getting paid for”.